Home Homepage Featured Hate is rising: how does DePauw react? In October alone, DePauw experienced four bias incidents targeting African-Americans, Asians, and the LGBTQ community. Last semester, seven such incidents were reported to DePauw’s Office of Public Safety. These incidents contribute to a national issue of rising hate incidents across college campuses. According to data compiled from 115 higher education institutions in Indiana by the U.S. Department of Education, the number of reported campus hate incidents increased from three in 2005 to 48 in 2016. But Indiana is not an outlier; across 6,506 higher education institutions in the country, the number of reported campus hate incidents increased from 44 in 2005 to 1,300 in 2016. Despite an increase in hate on college campuses, President Mark McCoy believes that DePauw is ahead of many other colleges when it comes to dealing with bias incidents. “College presidents have recommended a privilege/diversity requirement in the curriculum, hosting an event for the entire school to attend, and a dedicated committee to deal with bias issues,” said McCoy. 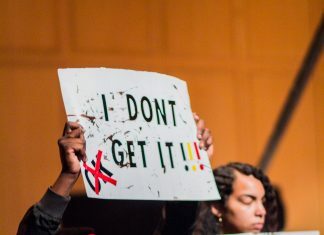 “DePauw has all three: a power, privilege and diversity requirement, a campus-wide Day of Dialogue, and a proposed diversity and equity committee,” he added. “Last month’s bias incidents are being handled more efficiently than those last April,” said Alan Hill, vice president of Student Academic Life. “We’re cognizant of the fact that we need to be timely to find out information, care, and support for those who are directly and indirectly affected,” he added. “In the past, the entire BIRT (Bias Incident Response Team) would meet after an incident occurred, which was difficult to organize because of scheduling conflicts,” said Myrna Hernandez, Dean of Students. “Now, depending on how the incident is reported, a small group of BIRT members will meet to address the issue immediately,” she added. However, only two incidents between this fall and last spring have been resolved. “This shows a flaw in their procedures,” said DePauw junior, Kaleb Anderson, president of the Association for African-American Students. “If there’s a low success rate and the perpetrators haven’t been punished, then that’s an issue,” he added. “I don’t feel safe on campus,” said a victim of homophobic slurs from last month’s bias incidents. “I get nervous when cars pass, and I’ll try to avoid people when it’s super late.” The victim admitted that DePauw feels safer than the general Greencastle area, but said they still worry about harassment from students. Sophomore Minkyo Park, another victim of last month’s bias incidents, received a shocking response when she posted about her bias incident on Facebook. “I had at least 10 DePauw students tell me, ‘this (racial slur) happened to me, too,’” she said. “Many said they didn’t know what to do about it”, she added. “I think the University needs to start paying attention to what the trends are in these hate crimes and if there is something larger happening on campus that we need to address,” said Anderson. Despite bias crimes being defined in the statute, Indiana is one of five states without a written law that punishes perpetrators. President McCoy is leading the charge to change that. In early October, he addressed a committee of Indiana legislators on the absence of a hate crime law. However, even with a written hate crime law, change won’t happen immediately. Before coming to DePauw, Aziz wrote a safe space resolution for the town of Bloomfield, Connecticut, which outlined a set of values that the town would uphold, including providing no assistance to programs or initiatives that discriminate on the basis of immigration status, race, ethnicity, religion, gender, and disability, among others. The resolution was passed in February 2017. Aziz said that he has written up a similar resolution for Greencastle but is still in the process of fine-tuning it before presenting it to Mayor William A. Dory, Jr.
“DePauw needs to organize cultural competency workshops led by students or faculty in local schools, libraries, rotaries, and churches,” he added. “It’s important for a predominantly white population like Greencastle to know there are successful black, Muslim, Jewish, LGBTQ, Native American, and Latino members of the community who are saving lives, serving in the military, and contributing positively to America,” he continued. “Cultural competency training should also be part of the regular programming at fraternities, sororities, and residence halls,” said Aziz.